Although most of the public outdoor sculpture at Columbia is located at the Morningside campus, there are also works of art installed at the Lamont-Doherty Earth Observatory in the Palisades. Measuring 14 feet in height, the bronze sculpture Equestrian Lincoln (Lincoln the Itinerant Lawyer) is installed on the lawn outside Lamont Hall. The sculpture is the work of prominent American woman sculptor Anna Hyatt Huntington (1876-1973), and until March 15, 2014, you can view more of her work at The Miriam and Ira D. Wallach Art Gallery for the exhibition Goddess, Heroine, Beast: Anna Hyatt Huntington’s New York Sculpture, 1902-1936. Art Properties also has in its collection her sculpture of Cranes Rising, 1934, which was loaned to this exhibition. Hyatt Huntington designed and modeled this enormous equestrian statue in 1961 and had it cast in bronze using the lost wax process in 1965. The sculptor was an active member of the American Academy of Arts and Letters and the National Sculpture Society, and today she is best known for her dynamic animal and equestrian works. In this late work, however, Hyatt Huntington took a more pensive approach to her subject matter, choosing to depict the young President reading while his horse is grazing. The statue is meant to evoke Lincoln's lifelong commitment to learning. The work of art was a gift from Hyatt Huntington to Columbia, and it was intentionally placed on the Earth Sciences campus in memory to both her father, Alpheus Hyatt, a paleontologist and naturalist at Harvard University and M.I.T., and to her husband, Archer Milton Huntington, an active member of the American Geographical Society. 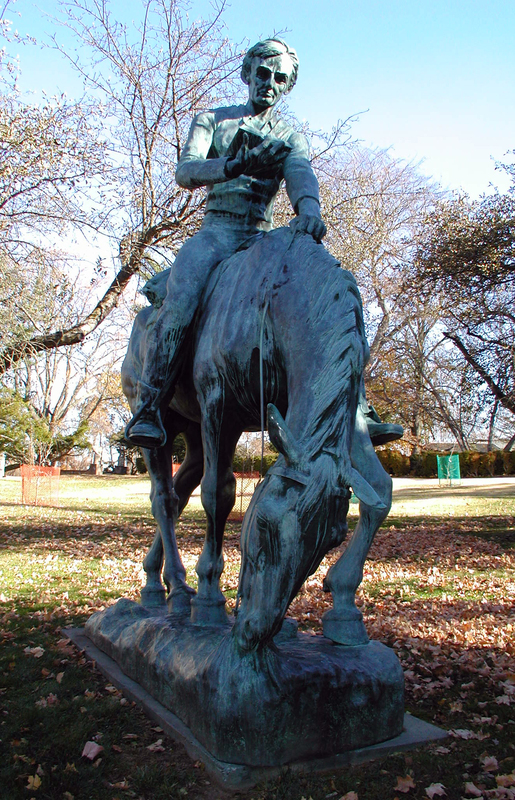 After being cast in bronze by the Modern Art Foundry on Long Island, Lincoln was installed in the orchard just south of Lamont Hall Library. It was unveiled by General Eisenhower in a ceremony held in October 1965. Davidson Taylor, then Director of the Committee on Art Properties, along with Hyatt Huntington and a committee of University officials, all agreed that the Lincoln should be installed on a low base to make it more approachable to viewers. In a letter to the artist, Taylor wrote that if "children want to play on it, well and good." 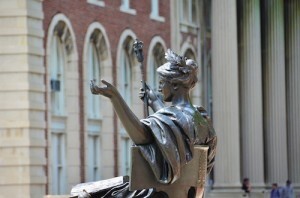 Columbia's version of the Equestrian Lincoln is one of several replicas made by the artist. The first cast was used to mark the entrance of the Illinois State Pavilion at the 1964 World's Fair, and it can now be seen in the New Salem Historic Park in New Salem, Illinois. In 1965 a second replica was sent by U.S. naval ship to Vienna as a gift from the 89-year-old Hyatt Huntington to the Austrian people after the Austrian Minister of Education reportedly admired the work at the World’s Fair. Two additional replicas can be seen in the United States today: one on Syracuse University's Environmental Science and Forestry Campus; and another on the grounds of the public library in Bethel, Connecticut. 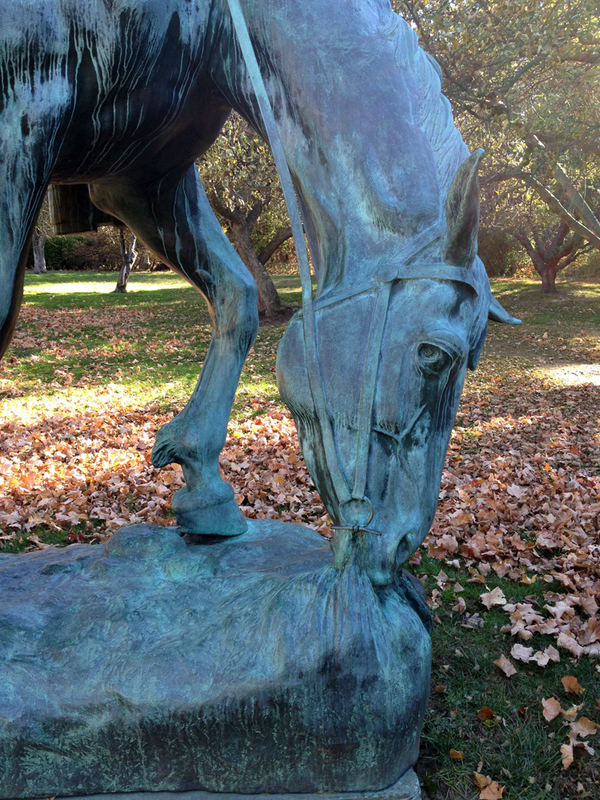 Image Credit: Anna Hyatt Huntington, Equestrian Lincoln (Lincoln the Itinerant Lawyer), modeled 1961, cast 1965 by the Modern Art Foundry, New York, bronze, Gift of the artist (1965.8.1). Photographs: Lillian Vargas (top) and Roberto C. Ferrari (bottom), Art Properties, Avery Library, Columbia University. This entry was posted in Lamont-Doherty Earth Observatory and tagged Anna Hyatt Huntington, AP photos, Equestrian Lincoln on March 6, 2014 by Roberto Ferrari.